SILICONE WEDDING RING: YOUR RING, ONLY SAFER AND TOUGHER! 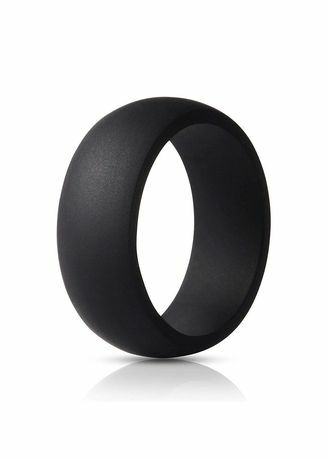 Nothing could satisfy your needs than the HonorRing Silicone Wedding Ring, the perfect alternative! Manufactured with high grade silicone; while providing comfort and safety to allow freedom to do any activity. Whether you work in construction sites where rough and heavy lifting is involved or involved in contact sports or rough outdoor activities; the silicone ring keep you perfectly safe from injuries. The Silicone Wedding Ring is stylishly molded to fit comfortably. It is a great GIFT for men who like to move around with a sentimental symbol of their pledge for love. Variety of colors to cater for different preferences. Incredibly durable, with a tensile strength rating exceeding 183N. Great gift for men who risk damaging metal rings during work. Lightweight for extra comfort during activity. Strong and comfortable enough to protect against de-gloving. No skin reactions or allergies.